The purpose of Electronics and Electricity Assembly Kits (M-KITS) is to provide the students with the necessary elements for creating their own circuits. Common Elements for all Kits: FA-CO. Power Supply. M-15. Components mounting base plate “M15. Development Module”. Kits, containing each one: Assembly and practice manuals (8 manuals supplied). Set of components and wires necessary for mounting the corresponding practice. After the first assembly, all the elements are recoverable. CAI. Computer Aided Instruction Software System: The best help in classroom for both teacher and students. Includes: 3.1) INSTRUCTOR SOFTWARE: INS/SOF. Classroom Management Software Package (Instructor Software). Only one package is needed per classroom. Helps creating databases, reports and statistical comparisons among many more features. 3.2) STUDENT SOFTWARE: M../SOF. 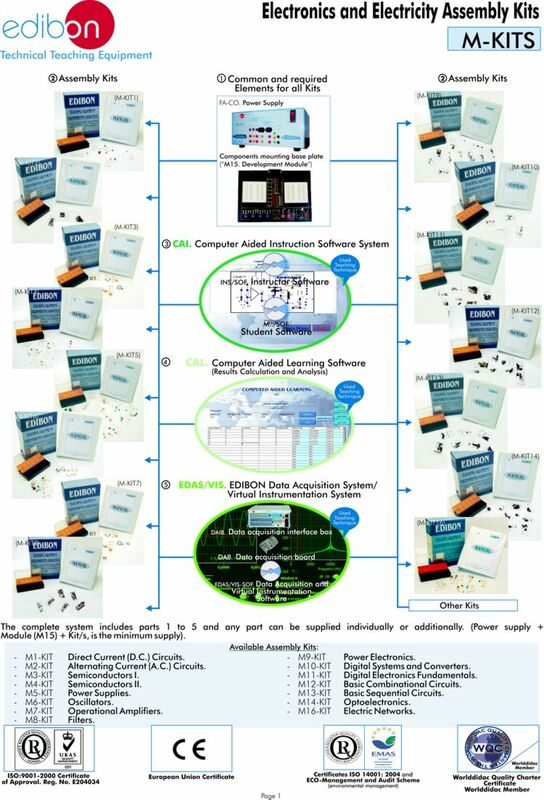 Computer Aided Instruction Software Packages (Student Software). There is a software for each kit.Gives the students the proper assistance on theoretical knowledge as well as in practice, presenting exercises and questions. CAL.Computer Aided Learning Software (Results Calculation and Analysis): Windows based software, simple and easy to use.Thought for Results Calculation and Analysis, this software computes and plots obtained data. EDAS/VIS. EDIBON Data Acquisition System/Virtual Instrumentation System: Includes: 5.1) Hardware: DAIB. Data Acquisition Interface Box + DAB. Data Acquisition Board. 5.2) Software: EDAS/VIS-SOF. Data Acquisition and Virtual Instrumentation Software.